Now that the temperature is starting to get a bit chilly are you craving the perfect homemade soup, but not a lot of time to prepare it? 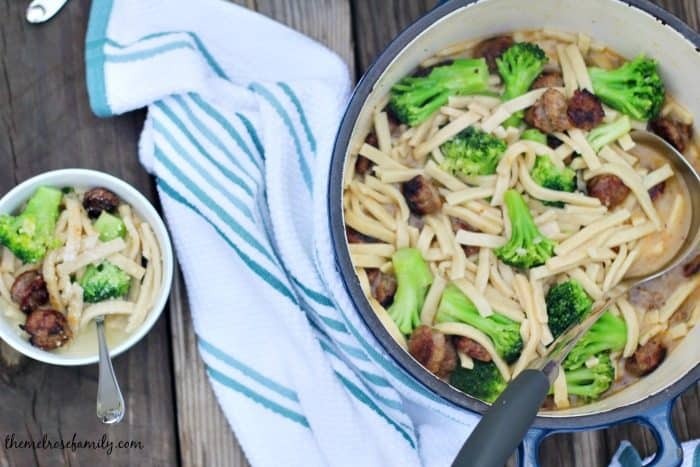 Our Broccoli Sausage Noodle Soup is the homemade goodness that your family craves all while coming together in less than 30 minutes. It took a long time for the chillier weather to get to Charlotte, NC this year. As soon as it hit I was in the kitchen in with slippers on making some of my favorite homemade soups. My girls are not huge fans of chicken. They never have been. There’s something about the texture that they both don’t like. Give them sausage though and they’ll eat two helpings. Well, my oldest eats two helpings of just about everything anyway so I guess for her I’d have to say three helpings. It’s funny because I remember having an appetite like her when I was little as well. Luckily, she loves broccoli too so this soup I knew was going to be a hit with her. My girls also happen to love the noodles in chicken noodle soup. I never seem to find the right noodles for it though. Until now! 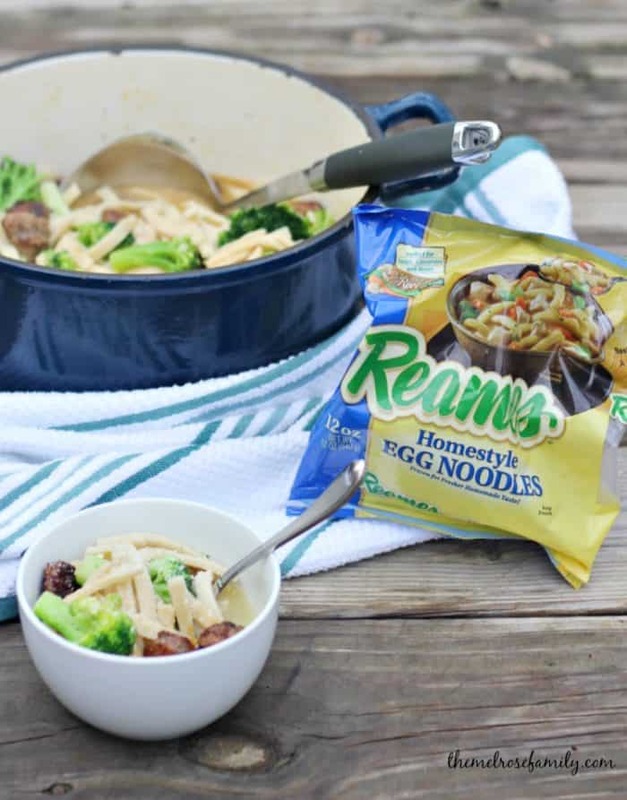 Reames® frozen homestyle egg noodles are the exact type of noodle that you would expect to find in a homemade noodle soup. Plus, they’re super easy to cook to the right consistency and they don’t take all day to make. 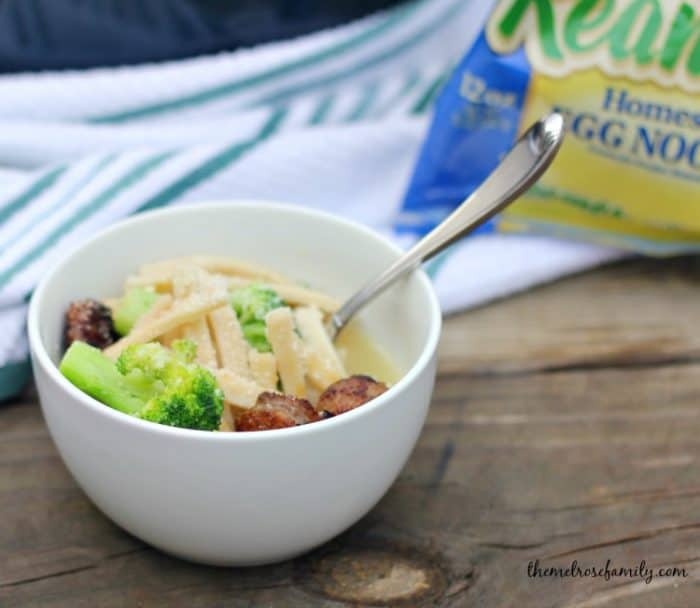 Reames is definitely the brand that takes you home when you taste them in this Broccoli Sausage Noodle Soup. Plus, you can save right now with this coupon on any Reames® product. Here’s my question for you though. When you think of soup do you think of something quick and easy? I normally don’t. I think of something that has to simmer all day on the oven and there’s normally tons of ingredients that go into making it. Not this soup! This soup is only five ingredients! 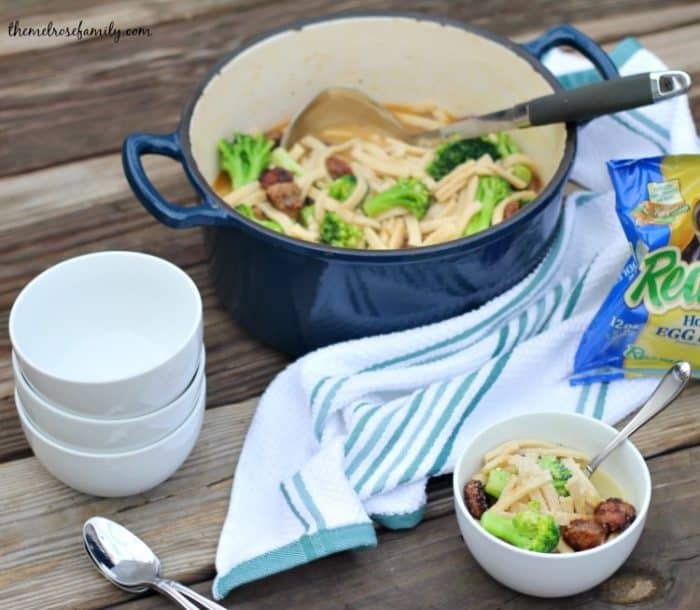 Sausage, broccoli, Reames noodles, chicken stock and parmesan cheese. That’s it! It comes together so quickly that I can walk in the door at 4:45 from gymnastics with the girls and have a bowl of soup in front of them by 5:15 to sit down as a family to enjoy a comforting meal. You really can’t go wrong it. Bring the chicken stock to a boil and add in the two bags of Reames noodles for 15 minutes on low. Meanwhile, thinly slice the sausage and brown in a separate pan. 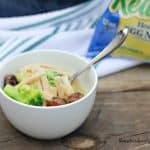 At the fifteen minute mark add the frozen broccoli florets to the Reames noodles and cook for another 5 minutes. Add in the cooked sausage and 1/4 cup of parmesan cheese and stir. Let simmer for a minute or two and then serve sprinkled with parmesan cheese. I would love to try this! My favorite pasta that reminds me of my mom’s is 4-cheese pasta. She made it with all these cheeses, including sour cream, so rich and delish! It would be perfect with these noodles! Oh yes ! Exactly what we need after the holidays weekend ! Thank you !